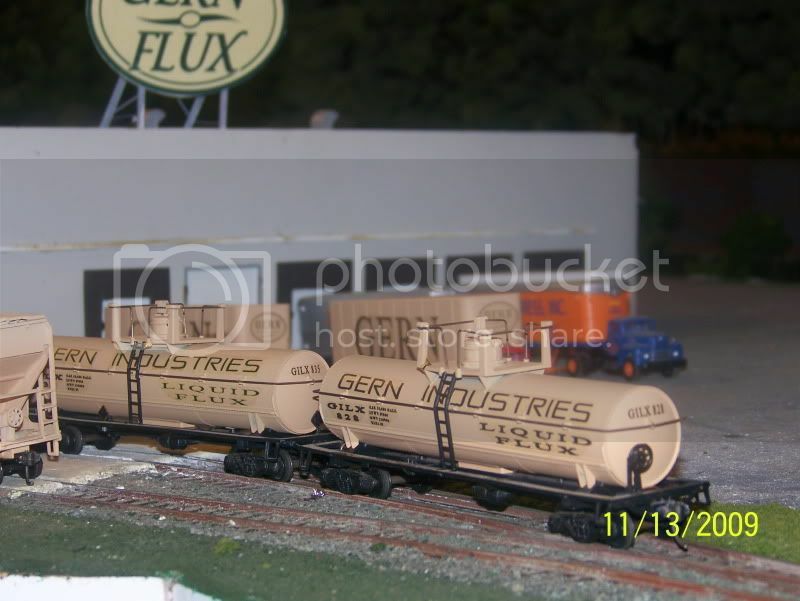 All GERN modellers are encouraged to post photos of their GERN Industries rolling stock here. this is an Atlas the only modification is the paint and decals. One of my first attempts at making my own decals. Athearn piggyback trailers. Removed one axle and painted. If anyone is interested the paint is Floquil Sand. Gern boxcar kitbashed from 2 Bachmann Hi Cubes. 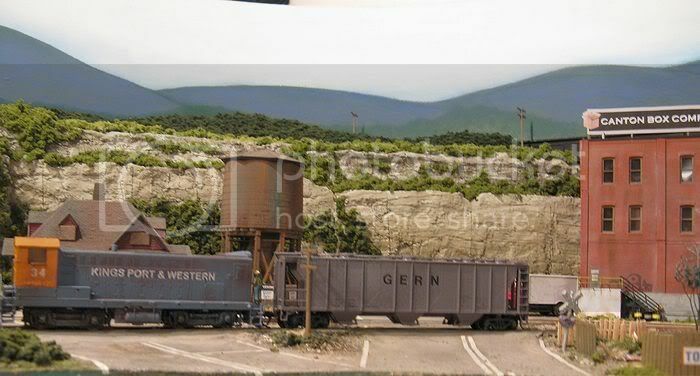 Gern covered hopper also a Bachmann cars. Your custom cars for Gern look great! I've come to realize that making custom cars is one of my fave aspects of model railroading. I've done a number of them for the club I belong to and for family and friends. I like the idea that I have unique rolling stock no else has. Your photos have inspired and rekindled an interest in making some more custom cars for my layout. 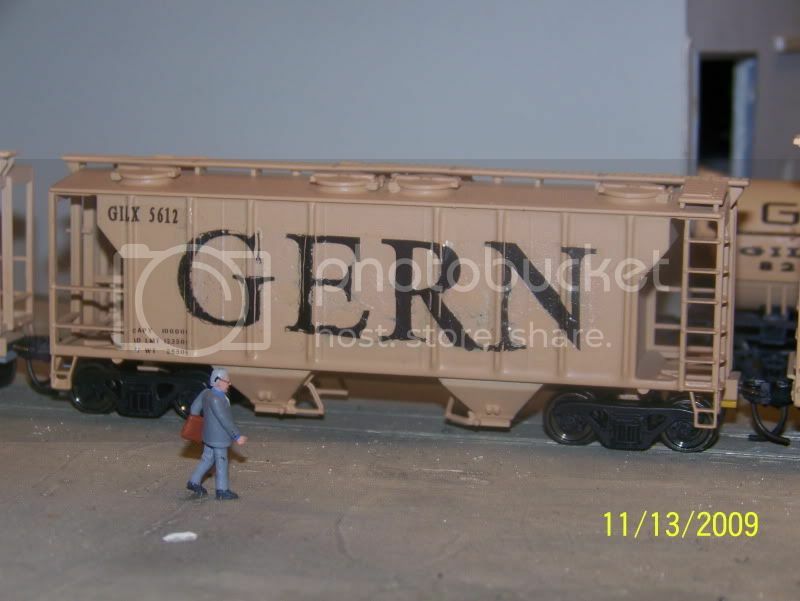 I've been getting a lot of things done lately that included using dry transdfer letters to make a GERN covered hopper. Wayne, I know there is a registry of GERN rolling stock someplace. Have you been assigning numbers? I need to add the GILX deignation and a car number to mine. Ralph Wrote: Wayne, I know there is a registry of GERN rolling stock someplace. Have you been assigning numbers? I need to add the GILX deignation and a car number to mine. Yup, I'm the one assigning the car numbers for GILX rolling stock, and have sent you a PM. 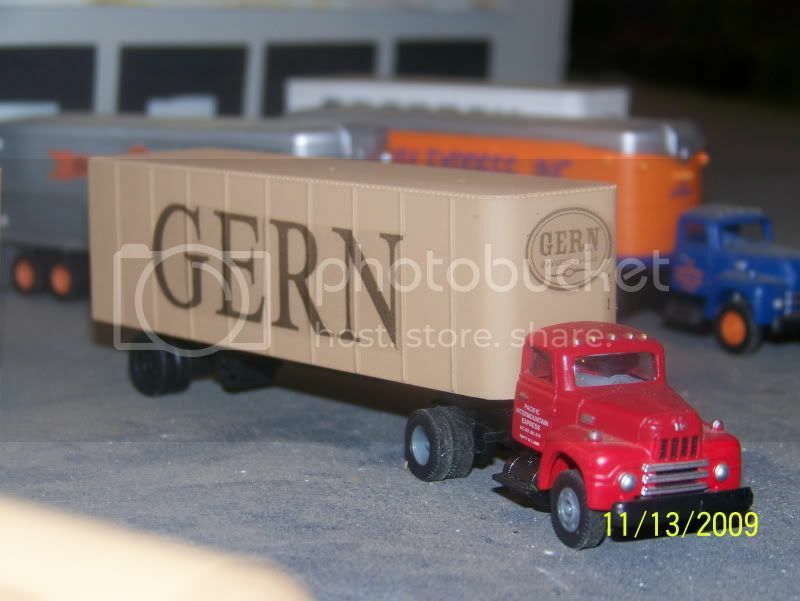 Anybody wishing to build GERN rolling stock, regardless of car type, should contact me for car numbers, which will be assigned to your cars only. My HO Gern hopper,This car was Lester's origonally I bought it from him and made a few changes of my own.It now has a trough style hatch made by Accu-Rail. 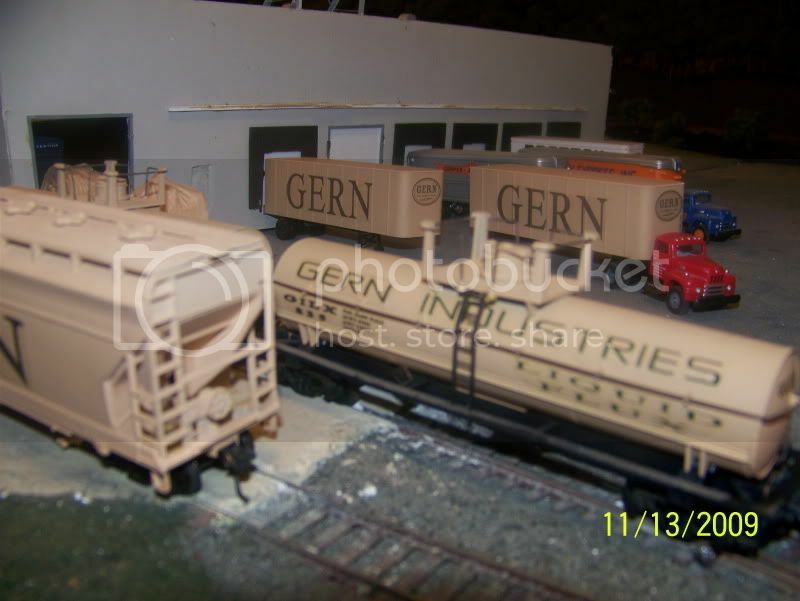 Next Gern car will be a Z scale cylindrical hopper. 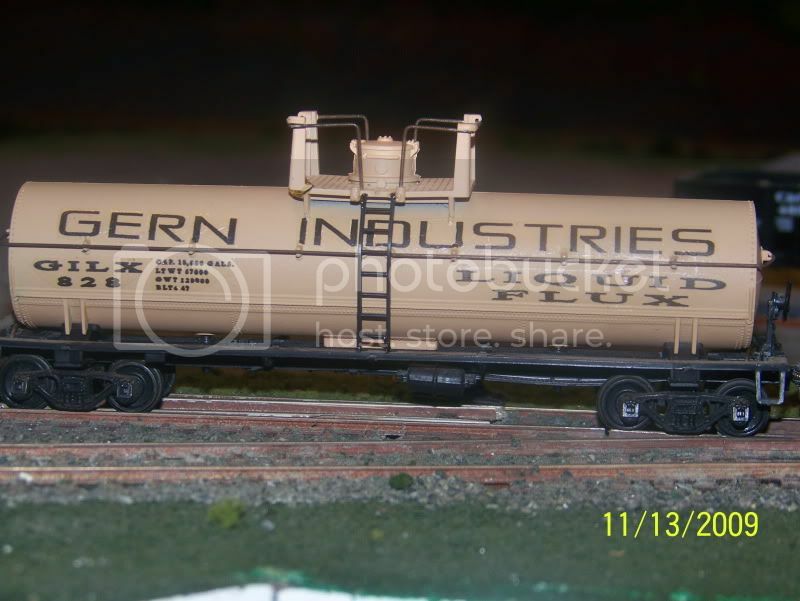 Is GERN shipped overseas in tankers? I suppose it could be, or in bulk freighters. There are GERN facilities world-wide and the products may be tailored to regional demands. If you have idle shipping capacity, though, with Liberian or Panamanian registry, you could probably make a few bucks. doctorwayne Wrote: I suppose it could be, or in bulk freighters. There are GERN facilities world-wide and the products may be tailored to regional demands. If you have idle shipping capacity, though, with Liberian or Panamanian registry, you could probably make a few bucks. It would probably involve a lot of selective compression, but I don't see why not. I do wonder about 'beige', though: nowadays it's fashionable to call it something like Mocha Crème Delight or Cocoa Café Surprise. Of course, GERN modellers have free rein when it comes to colour choices. So "Floquil Sand" then, although I'm old fashioned enough to still call it beige, or Army Base Brown. I've been around the block waaay too many times and I have seen sand at places like Fort Irwin and on seashores that doesn't look anything like what Floquil thinks it does. I have even seen black sand. I'm not a big fan of artsy names for colors, either, unless they clearly convey the hue and shade. "Sea Foam" means nothing to me as an accurate descriptor. Neither does "Sante Fe Sunset", "Fall Delight", Spring Caress, "Glorious Morning" or any of those other titles that seem so titillating to interior designers. Back to the point. A challenge for any modeller would be to put a GERN bulk carrier into their harbor scene, along with appropriate loading/unloading equipment for said cargo and paint it "GERN Ecstasy" for all I care. I agree with you on the designer names for paint colours, but, in a way, we suffer from the same problem with model railroad paint colours. Just because a paint is called Santa Fe Freight Car Brown doesn't necessarily mean that it's correct for a Santa Fe freight car - it may be or not, but it may also be correct for some other road's freight cars or depots or whatever. Too many people seem to see only the name when they should be looking at the colour. I'm also puzzled by those who claim to have "no sense of colour" (those who are colour-blind needn't comment ): they may not be able to mix a desired colour, but I can't believe that when given a number of options, with only one being a true match, that they can't either select the right one or, if the graduations between the options are very fine, at least pick something close. Likewise, limiting our choices to model railroad paint also limits our options. Many of the paints designed with other hobbies in mind (or other uses, as Jeffrey has so capably demonstrated) have applications in model railroading: a good example is the acrylic paints designed for clear plastic racing car models, as it's a tough, flexible paint with good adhesion properties, ideal for painting Delrin and other acetal plastics which are often used for model railroading detail parts. i never limit myself to specific brands of colors, especially since I first encountered Floquil a long time ago in the military modeling and fantasy modeling arenas. It does get tricky at times, however, figuring out what paint will work best, which is why a good primer is mandatory, because even if your particular choice won;t stick to the model, it will stick to the primer.